There's nothing like a good mix of crime and Christmas stories to get you in the holiday mood. Drawing from a remarkably diverse array of notable and celebrated authors, Soho Crime has delivered yet another brilliant Christmas-themed anthology with The Usual Santas. The subject matter differs significantly, ranging from carefree and whimsical to dark and foreboding. This enchanting and easy to read collection features 18 stories from bestselling and award-winning authors such as Martin Limón, Stephanie Barron, Gary Colby, Ed Lin, Mick Herron, and many others. The foreword by Peter Lovesey, who also contributes to the collection, reminds the reader that crime is regrettably a part of the holiday season, and thus why this time of the year has inspired more short stories than any other theme. 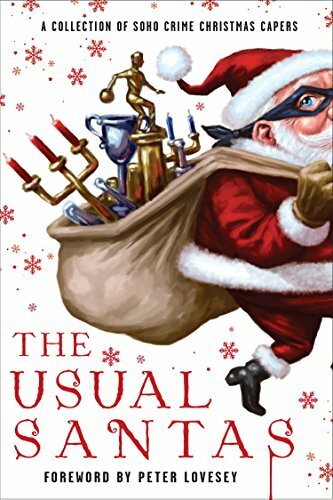 In this quirky assemblage of yuletide crime capers we read about nine mall Santas who must find the imposter among them. An elderly lady seeks peace from her murderously loud neighbors at Christmastime. A young woman receives a mysterious invitation to Christmas dinner with a stranger. Niccolò Machiavelli sets out to save an Italian city. Sherlock Holmes’ one-time nemesis, Irene Adler, finds herself in an unexpected tangle in Paris while on a routine espionage assignment. Jane Austen searches for the Dowager Duchess of Wilborough’s stolen diamonds. These and other escapades will most certainly charm most readers and instantly transport them to exotic and faraway places such as a Korean War POW camp to a Copenhagen refugee squat, from a palatial hotel in 1920s Bombay to a crumbling mansion in Havana, to the busy streets of Thailand. The Usual Santas is assembled into three parts and begins with “Joy to the World: Various Acts of Kindness at Christmas,” which includes Mick Herron’s titled story “The Usual Santas,” where eight Santas customarily hired by a mega-shopping mall in the suburbs outside of London unexpectedly realize a ninth Santa in their midst. How they expose the imposter adds to the amusement of the story. Things take a distinctly bleaker and sullen tone in the next segment entitled, “Silent Night: The Darkest of Holiday Noir.” In “Queen of The Hill,” by celebrated novelist Stuart Neville, Campbell Hunter, or Cam the Hun as he’s known on the streets, sets off for a Christmas party at the Northern Ireland house of an infamous but charming drug dealer. This story has some twists and turns in store for its lead character. In “Blue Memories Start Calling” by Tod Goldberg, the bodies of a missing family are found in a grave near a Granite City ski resort. The grisly discovery just before Christmas and its repercussions cause the County Sheriff to seriously reevaluate his career and life. In the third section, “I Saw Mommy Kissing Santa Claus: And Other Holiday Secrets” the stories delve into historical and literary themes. In “The Prince (of Peace),” by Gary Corby, Niccolo Machiavelli saves an Italian city from Cesare Borgia, while pondering the meaning of Christmas. In Clara Black’s “Cabaret Aux Assassins,” Irene Adler, Sherlock Holmes’s past archrival, is in over her head in Paris while on her way to a spying mission and Jane Austen searches for a Dutchess’s missing diamonds in “Jane and the Midnight Clear,” by Stephanie Barron. Overall, The Usual Santas will most certainly melt and captivate the hearts of the most hardened crime fiction reader. There’s plenty of humor and inspiring stories of the holiday season throughout the anthology, but be warned there are also some dark and suspense-filled tales as well. It’s a great book to take on your daily walk or commute to work. Just remember to keep it nearby for those times when you have a few extra minutes to escape. This delightful short story collection will not disappoint and will be the perfect stocking stuffer for any crime noir or mystery fiction fanatic on your holiday gift giving list.